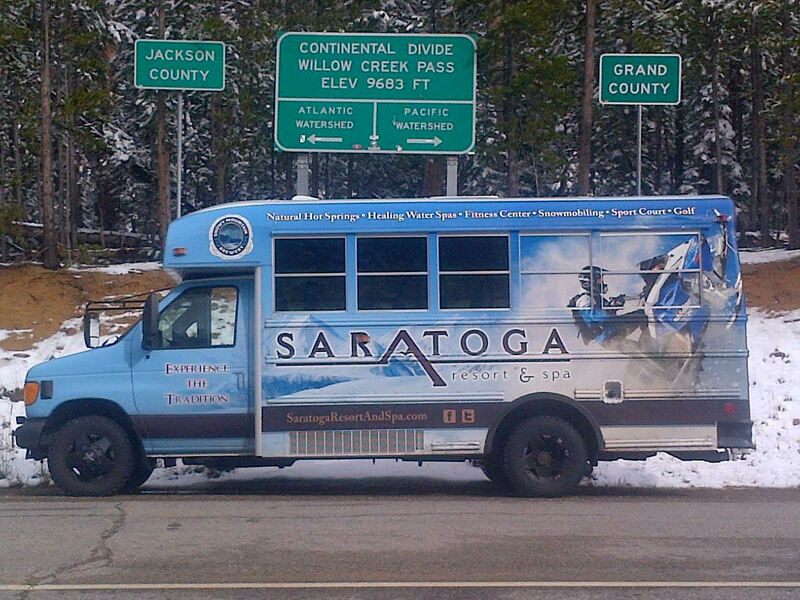 The Saratoga Hot Springs Resort is easily accessible from 3 main routes: Interstate 80, Highway 230 and Highway 130 – The Snowy Range Scenic Byway. Note: Snowy Range Scenic Byway is closed seasonally from early-mid September until the end of May-early June! Travel west on Interstate 80 for 76 miles to exit 235 at Walcott Junction. Head south (left) on Highway 130 for 20 miles to Saratoga. Proceed 0.8 miles to Bridge Street and turn east (left). Follow curve as route becomes Pic Pike Road. The Saratoga Hot Springs Resort is ahead on your right. At Highway 230 Junction, turn north (right) and continue 18 miles to Saratoga. Proceed 0.8 miles to Bridge Street and turn east (right). Open Memorial Day through October, weather permitting. Take exit 311 from Interstate 80 and travel south on Highway 230/Snowy Range Road for 0.7 miles. At Highway 130/230 Junction, turn north (right) and continue 8 miles on Highway 130 to Saratoga. Travel one block, go over bridge and turn right (south) onto E. River Street. 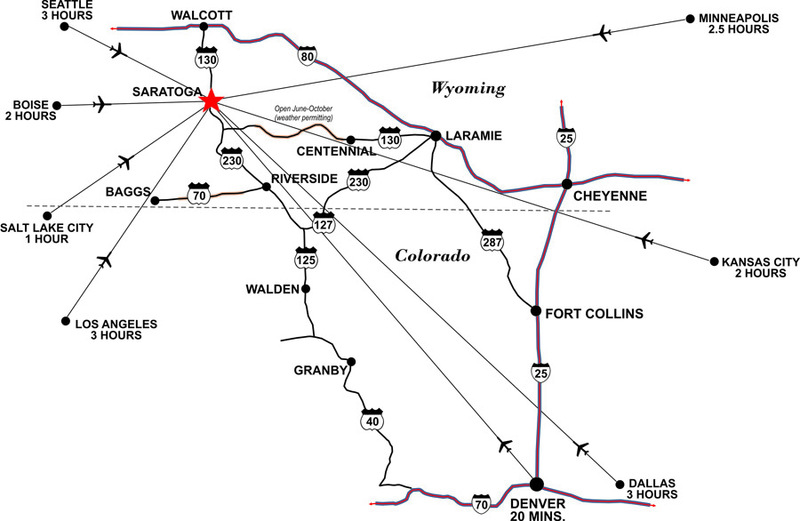 Saratoga, Wyoming is easily accessible by travel jet. 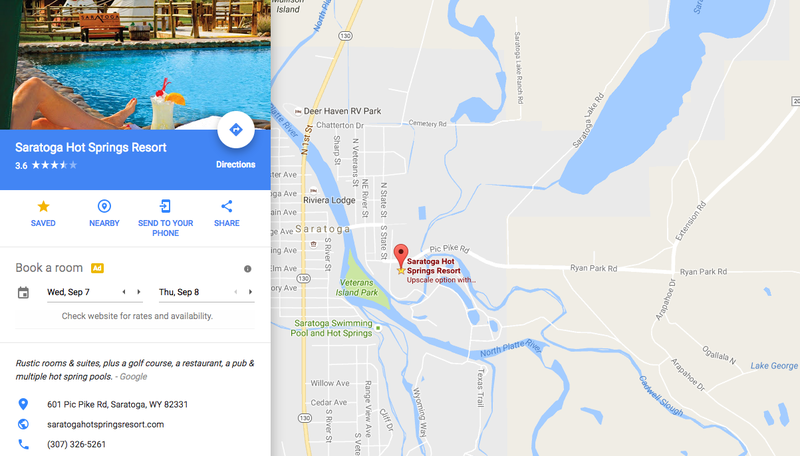 Shively Field Airport offers private jet charter service, air charter flights and is conveniently located within a mile of the Saratoga Hot Springs Resort. Please note, this is a non-commercial airport.